The above is a great video explanation of the venues of the 2018 PyeongChang Olympics. Below are a few of the fun facts I like. The Impermanence of the Olympic Stadium: The PyeongChang Olympic Stadium, which will house 55,000 people (including me) is a temporary structure. After the Games, it will be dismantled. 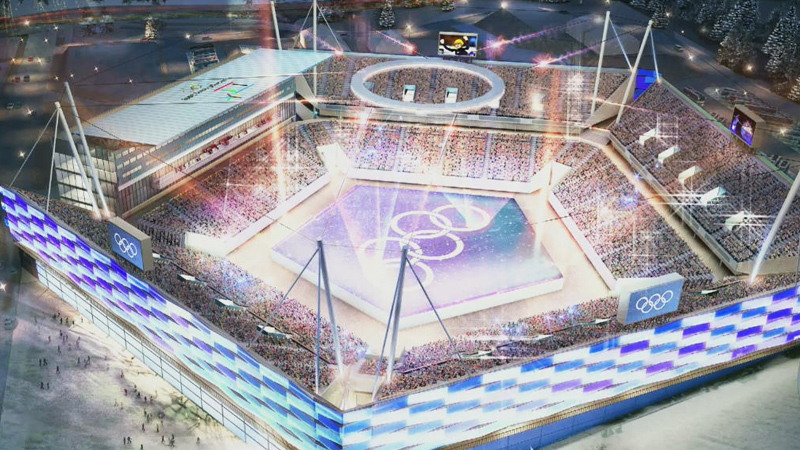 Apparently, the 1992 Albertville Winter Games were the first to decide that taking care of a Winter White Elephant was simply not smart economics, and the organizers of the PyeongChang Olympics thought similarly. Winter and Summer Fun: The Alpensia Ski Jumping Center in the Taeback mountain range was originally planned as the site for the opening and closing ceremonies. Instead it will be host to ski jumping and the Nordic combined events in February. What’s interesting is that the landing area for ski jumping is about 100 meters, so the organizers thought that the space could be converted into a football stadium, seating 11,000, for the summer months. 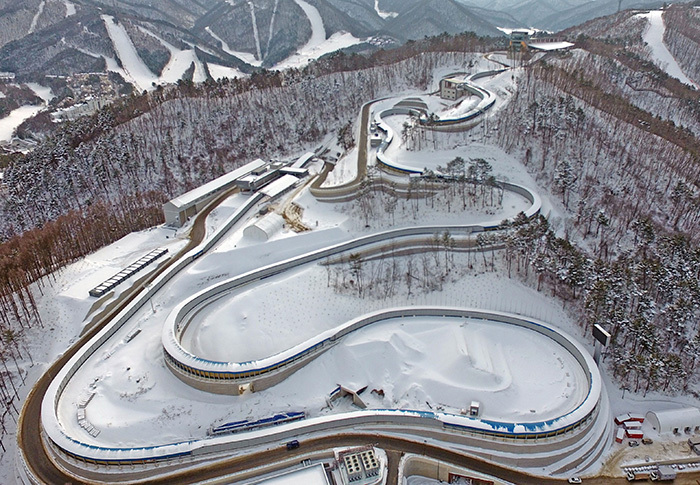 Remember 2018: The Alpensia Sliding Center, which will house 7000 spectators to watch the bobsleigh, luge and skeleton competitions, has a snaking track that runs exactly 2,018 meters, so bobslieghers will never forget the year they glided to glory in South Korea. Desecration or Modernization: The Jeongseon Alpine Center is a series of new ski routes and structures built on previously virgin forest ranges on Mount Gariwang. As is explained in the video, this area was one of the few areas that could fulfill a requirement of a slope that had a virtual drop of 800 meters, and so the Korean Forest Ministry okayed the opening up of the 500-year old protected forest that is now the site of the alpine events. This development has been the object of ongoing protests regarding the sites impact on the environment, among other things. In late 2004, New York City wasn’t seen as having much of a chance to win the right to host the 2012 Summer Olympics, at least by bookmakers in London. According to a November 16, 2004 Newsday article, Paris was viewed as 1-2 favorites – in other words, for every $2 you put down on Paris, you’d win $1 assuming Paris won. London and Madrid were seen as good chances as well, at 3-1 and 4-1 respectively. New York City was considered unlikely at 14-1, although Moscow seemed out of the running with 33-1 odds. Europe appeared to have a lock on the 2012 Games. New York City had advantages: a modern metropolis with world-class facilities in a compact area, a diverse and energetic populace, financial feasibility, as well as a powerful PR man in Mayor Michael Bloomberg. The organizers of the Paris Olympic bid were dismissive of the bid coming out of the US. After all, Paris is not only the birthplace of the modern Olympics, it had hosted the Olympics three times, and had more recently built up credibility over two previous bids. New York City, on the other hand, was the biggest city in the increasingly unpopular United States and President George Bush, who led the surprising charge into Iraq. With America fighting such an unpopular war, what is to stop terrorists from targeting New York City again during the Olympic Games? Perhaps that issue weighed heavily in the minds of the International Olympic Committee. Perhaps not. It’s possible that the bigger advantage that Paris had over NYC was that Paris had The Stade de France – a newly built stadium that seated over 81,000 in the center of Paris. At the last stage in the bidding process in February, 2004, New York City still did not have a definitive plan for a stadium. This was New York’s 20th century West Side Story. And strangely enough, it involved The Jets. In the 26-acre area squared in by 30th and 42nd streets, and Tenth Avenue and the Hudson River, is the Long Island Railroad (LIRR) train terminal where trains departing Penn Station a few blocks away rest. It has been an open air eyesore in a poorly developed part of Manhattan, that had been a target for development and reinvigoration by city planners for decades. The fact that there was no subway service to that area, among other reasons, made it a challenging decision to give he go ahead to further develop this massive plot. But when the Daniel L. Doctoroff, the deputy mayor, and Mayor Michael Bloomberg teamed up for a vision of an Olympics across all five boroughs of New York City, its center in Manhattan, momentum began to build for the establishment of an Olympic Stadium in area called the West Side, but they began to call the Hudson Yards. The American football team – the New York Jets – were bought by Woody Johnson four years previously. His Jets were sharing a stadium with the New York Giants in New Jersey, and so Johnson wanted to have a stadium exclusively for his team. Thus was hatched a plan for The New York Jets to spend $800 million for a stadium on the West Side, with the city and state governments providing another $600 million to fund the construction of the platform that would cover the trains and tracks of the terminal. The vision included the stadium’s linkage to the aging Jacob Javits convention center, which was the city’s premier convention center, but tiny compared to the centers in other major cities. The new stadium would include a roof that would open up a massive amount of space for conventions, and thus potentially attract significant business and visitors to the Big Apple. And yet, this was not a vision universally approved. For one, James Dolan, the owner of Cablevision and Madison Square Garden, objected to a rival sports complex opening literally blocks away from his own. Dolan not only aired critical ads against the proposed stadium, he eventually fought back by offering the Metropolitan Transit Authority a bid to compete with the new York Jets’ bid. Additionally, voices were vociferously raised against the stadium by people living in the surrounding neighborhoods, as well as the nearby theater district, who saw the increased construction and traffic as a problem worth protesting. So even before the IOC voted on which city to select for 2012, a New York State board called the Public Authorities Control Board (PACB), put a dagger in the heart of the New York City bid. The PACB represents the New York State governor and the leaders of the State Senate and Assembly, and they voted to not approve the plans for the stadium and the convention center extension, perhaps reluctant to use significant state funds for a massive city project. In the end, the London bookies were right – the winning money was indeed on London. The Jets would remain in New Jersey. And New Yorkers would get on with their lives. Fuhgetaboutit.